Orléans Express is a coach operator in Quebec, Canada. It runs buses exclusively in Quebec. A sister company, Acadian Lines formerly provided service until late 2012 throughout Atlantic Canada. Maritime Bus, a subsidiary of Coach Atlantic Group, now provides similar services connecting with Orléans Express at Rivière-du-Loup in Quebec. 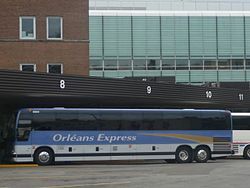 Travellers from Ontario and western Canada on Greyhound Canada (Canada's largest inter-provincial coach line) can connect to Orléans Express in Montreal. Expedibus is a package shipping and courier company, operated cooperatively throughout Quebec by Orléans Express, Intercar, Autobus Maheux and Limocar. This article about transport in Quebec is a stub. You can help Wikipedia by expanding it. This article related to bus transport in Canada is a stub. You can help Wikipedia by expanding it. This page was last edited on 21 February 2019, at 11:08 (UTC).